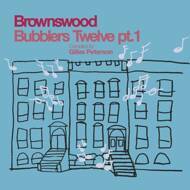 Compiled by DJ, record collector and label boss Gilles Peterson, the tastemaking Brownswood Bubblers series returns. Released on vinyl for the first time, the idea remains the same – shining a light on new and under-the-radar talent. The roll-call of artists who’ve appeared on the Brownswood Bubblers series is impressive. Boasting alumni like Flying Lotus, Dam-Funk and Floating Points, the compilations have long championed the rising stars of underground music. The first edition since 2014, Brownswood Bubblers 12 picks up where 11 left off – by looking to the acts set to make waves in 2017 and beyond. With a whole three years having passed since the last Bubblers was released, too much exciting music has amassed to fit onto one release. For that reason, it’s been split into two parts – making room for the whole, expansive spectrum of new sounds, this first part will be followed by a second in the coming months. The new compilation arrives as Peterson’s independent label Brownswood Recordings – from which the series takes its name – kicks off celebrations for its 10th birthday. With two compilations, Brownswood 10 and Brownswood 10 Versions, celebrating the label’s shapeshifting legacy, the return of Brownswood Bubblers is a welcome look to the future.